Approx 750 clips, 11mm long with 10mm legs. 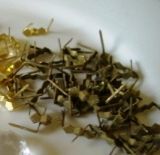 Approx 650 headed brass pins. Approx 650 headed chrome pins. 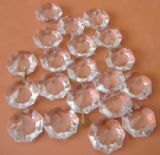 Flower shaped drops with flat back and one central hole 20mm diameter. 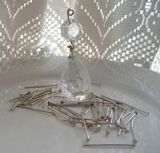 Flower shaped drops with flat back and one central hole 25mm diameter. 100 Almond drops measuring 63mm long x 40mm wide.